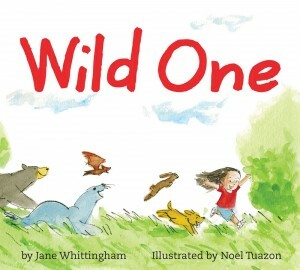 “Wild One by Jane Whittingham and illustrated by Noel Tuazon is just adorable…. Rhyming stories are notoriously difficult to pull off well without seeming forced; most publishers won’t touch them. Here, they flow – and still manage to surprise….Whittingham’s smooth rhyme and consistent rhythm are beautifully matched with the illustrations. Tuazon catches the expressions of a child on adventure just so, and his animals make this reader smile with every page. (That whale!) The watercolours brighten the page while suggesting the blending of everyday and imagination – watercolours, like Let’s Pretend and other imaginative games, never truly stay within the lines. “Canadian librarian and writer Jane Whittingham and Canadian illustrator Noel Tuazon have teamed up to bring readers the exuberant, fun and all-around winning picture book Wild One. Written in rhyming couplets- a form in picture books I absolutely adore when done fittingly – Wild One tells the story of a young girl’s very busy, very active day, with actions mirroring those of animals. Accompanied by Noel Tuazon’s soft yet sunny and bright illustrations, Wild One is a lovely treat…. “[A] cute story by Burnaby, British Columbia, librarian Jane Whittingham…The illustrations look like they have been done in watercolour, which I love, and the little girl, and the animals she turns into, are realistic and cute. I can see how a child would stretch like a cat or hang like a bat.